It’s almost officially summer, but we’re already in the heat of the 2018 whale season. It’s been a record year for the number of transient (or Bigg’s) orca whales. In fact, we’ve seen killer whales on over 64 tours in this young season. June is Orca Month in Washington state which traditionally kicks off the “prime-time” whale watching season. The amount of killer whales coupled with some amazing humpback, minke, and gray whale sightings makes us extremely excited for this peak season! There’s nothing like a summer day in the Pacific Northwest. The sun gets up early and sets late, leaving an entire day’s worth of activities to be discovered. Wth the long days, we are able to offer three different afternoon tours –– each with their own benefits! Often times, deciding on a departure time can be one of the hardest parts of the reservation process. We can confidently say that there isn’t a tour time that’s better than the other! We recommend choosing the departure time that works best in your schedule. Whales aren’t on a rigid schedule, so both tours have the same whale sighting success rate. The benefits of morning versus afternoon come into play on the human side. Morning tours are great because you’re first out on the water and have the rest of the afternoon to do as you please. The afternoon tour is great because you don’t have to get up early, and you end your day with whales and some pretty incredible lighting for photographs. 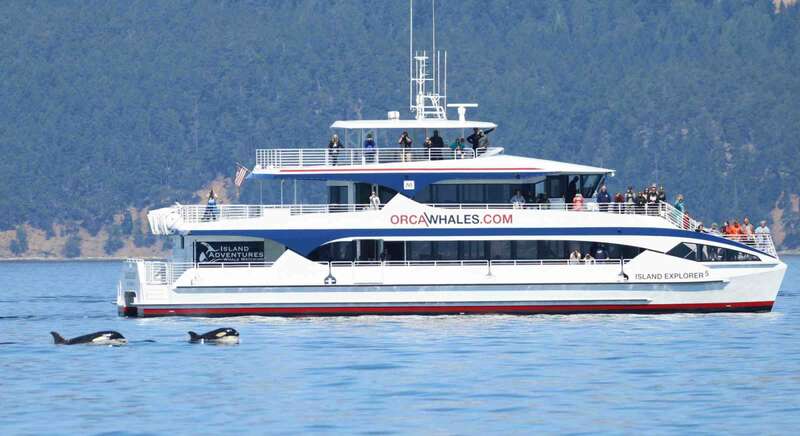 During peak season, the 4:00 PM departure from Anacortes is most popular with our staff, locals, and professional photographers. There’s an advantage to the afternoon tour as we already know either where the whales are or where they’re not. Also, the lighting in the evenings softens, making it absolutely incredible for photographs! Our 2.5 hour La Conner Deception Pass cruise departs directly from the historic La Conner waterfront. This cruise heads south through Swinomish Channel sailing under the brightly painted Rainbow Bridge. We’ll then enter Saratoga Passage and onward to the breathtaking Deception Pass bridge, one of the most photographed destinations in Washington. Our crew will make this tour educational and entertaining while pointing out wildlife and scenery along the way.